If this page does not answer your questions, please contact us. Why should I use Boatmatch.com to sell my boat? Launched in 2000, Boatmatch.com offers all the advantages of marketing on line perfectly balanced with a traditional boat brokerage service. Boatmatch.com offers a proven route to market with sales of hundreds of boats worldwide. Boatmatch.com offers the best service on the best terms, our considerable experience in negotiating and managing sales will make buying or selling your boat a pleasurable experience. How much does Boatmatch.com charge to sell my boat? Do I have to pay Boatmatch.com if I buy a boat? Customers pay no fees when purchasing a boat. Why should I use a British Marine accredited yacht broker? How do I register and sell my boat? It's easy, just click the link 'sell my boat', register and enter your boat details. The listing process is straightforward with section headings to help you enter information and photographs of your boat. Once registered, you can set a user name and password enabling you to access your listing at any time to update the information and pictures. Why should I use Boatmatch.com to buy my boat? Our experienced brokers will provide full details of boats on brokerage, arrange inspections and help you at all stages of a sale, making buying your new boat a straightforward and enjoyable process. How does Boatmatch.com get my boat to market? 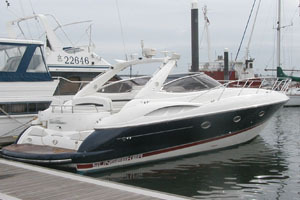 In addition to our well established web presence, Boatmatch.com has a live database of boat owners and buyers looking to buy, sell or part exchange yachts and powerboats. In addition Boatmatch.com promotes our clients boats through a highly targeted promotional campaign through the internet, marine portals and print media. No other broker offers this high level of access to the world market at such a competitive rate. In accordance with the UK Data Protection Act, Boatmatch.com will not disclose details of registered buyers or sellers to any third party without their express permission. Boatmatch reserve the right to send suitable and relevant communications to registered clients on behalf of third parties unless specifically requested not to on registration. We are keen to improve our service and this website. If you have any questions, suggestions or ideas on how our service can be improved we would be delighted to hear from you. It is always advisable to speak with Boatmatch.com to get an accurate market value for your boat, please contact us by email or call +44 (0) 7855 787561 and ask for brokerage sales.